As a longtime columnist here at Lowcountry Weekly, I am always intrigued by other columnists and how they ply their trade – especially those who are much more successful than I and who, unlike me, have had the gumption to compile their old columns into books to be published. Ken Burger is just such a columnist, and I salute him. 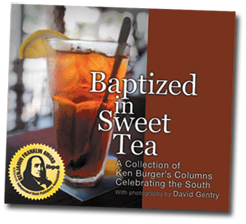 Burger’s new book ‘Baptized in Sweet Tea” is a collection of columns he wrote for the Charleston Post & Courier over the past few years. As the title hints, the common thread running through the collection is Burger’s southern-ness… and, more specifically, his identity as a born-and-bred South Carolinian. Having recently retired from a long newspaper career, Burger is now in his early 60s. While he may have been baptized in sweet tea, his essays are steeped in a bittersweet nostalgia for a way of life that’s passing into memory… and a reverence for those timeless qualities that abide. Here you’ll read about seersucker suits, screen porches, country doctors, fathers who never cussed (and sons who do), mothers who raised whole villages of children, funeral processions, showing honor, and “being sweet.” There are words of wisdom here, but also prayers of confession. There is humor and pathos, but never too much of either, always just enough. Burger writes with a light touch, and as a result, he’s fine company. This sweet tea goes down easy. How’s that for inspiration? Did I mention he’s working on a third novel? “Baptized in Sweet Tea” is a great-looking book, illustrated throughout with beautiful color photographs by Burger’s friend David Gentry. There are graveyards and church ruins on these pages, Coca Cola signs and pick-up trucks, golden marshes and blue-gray beaches. All of the images are moody and poetic, the perfect seasoning for Burger’s tasty prose. As I meandered through “Baptized in Sweet Tea” the other evening – savoring an essay here, a picture there, and a glass of wine – I kept thinking what a great present it would make: for an older southerner who longs to remember… for a younger southerner who’s only heard tell… even for a non-southerner who simply had no idea. I guess that covers just about everybody, doesn’t it?